The indices (that’s the pips in the corners) are much larger than on standard playing cards. The numbers on standard faces are about 8mm, whereas these cards have 15mm numbers. The faces are 4-index (that means a pip in every corner) so you can fan them in either direction and still read them. Perfect for left-handed, right-handed and ambidextrous players! The usual pattern of suit symbols and court-card illustrations are still in the card centre. This makes it simple to distinguish between the cards that might otherwise cause confusion (6s and 9s for example). We’ve printed the gorgeous and best-selling Emporium design on the card backs, so you can have extra enjoyment from using these cards. We’ve also produced them on Premium Quality board for the ultimate cardplay experience. The two packs are beautifully packaged in one of our handmade presentation boxes, giving them the same love and care as the rest of the cards in our range. The Emporium with Large Index Faces are standard bridge-size cards (58 x 89mm) so they’re easy to hold. The Emporium with Large Index Faces are standard bridge-size cards (58 x 89mm) and it’s just the print that is larger. This means that they’re just as easy to shuffle, deal and hold as regular bridge cards. It also means that they can be used in card holders and shufflers – exactly the same as all the other bridge cards in our range. Black-lined for opaqueness, the beauty of the dense 330gsm board is that it has optimum flexibility. 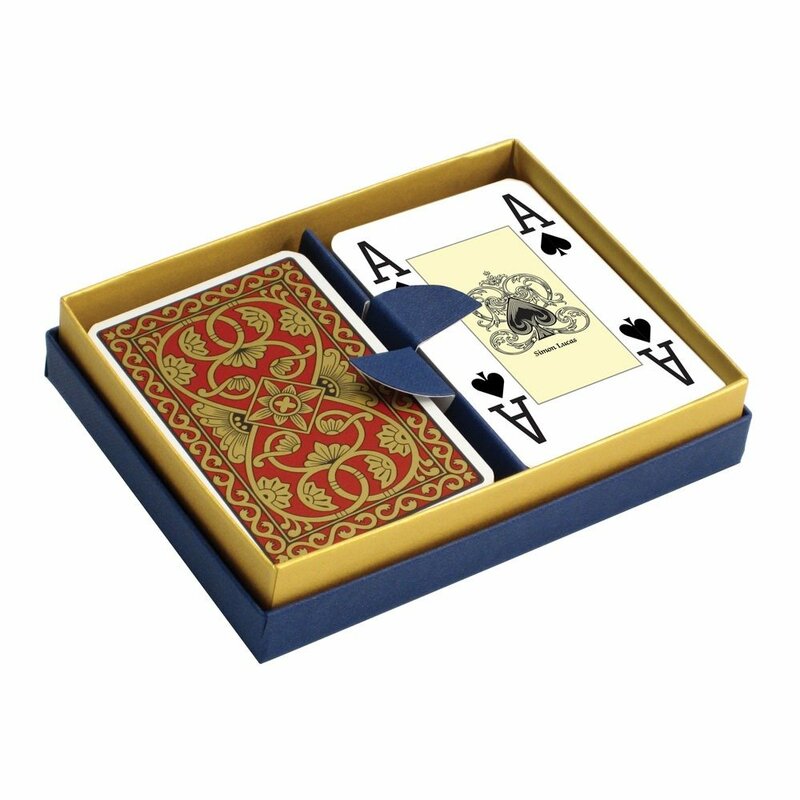 Finished with a special varnish for the most favourable slip and handling, these beautiful playing cards are durable and a delight to use, providing a top-quality cardplay experience. We really enjoy seeing the delight on customers faces when we hand them a pack to shuffle! Smartly presented in a chic handmade presentation box in matching colours.